Machzor according to Ashkenazi rite – prayers and piyyutim for the Three Festivals, the Four Parshiot and the High Holidays. [Augsburg: Chaim son of David Shachor, 1536]. Printed without title page. The text begins on verso of the first leaf (p. 2) with the prayer Shochen Ad, followed by the Yotzer for Shabbat Chanuka. The machzor contains the piyyutim and yotzrot for the Festivals and holidays and does not include the regular prayers. The printer's colophon appears on the last leaf: "The Ashkenazi rite machzor was printed and completed on Tuesday, the 11th of Iyar… in Augsburg the capital city by Chaim son of R. David Shachor". An owner's signature in early Italian script appears at the top of leaf , from the month of Kislev 1598, slightly cutoff due to trimmed leaves: "[---] Rosh Chodesh Kislev 1598… that I, Ms. Tamar (acronym), the widow of R. Moshe son [---] Halpron, gave this machzor as a gift to my son Aharon… So no person should rise and contest this fact... And the aforementioned Tamar has commanded me Shlomo Zechar[ya] to write this in the book to be a sign. Shlomo Zecharya Catil[ano]". Presumably, this machzor was used by the chazan in the synagogue of one of the Ashkenazi communities in Italy and therefore, marks and inscriptions in Italian script appear in many places, marking the sections recited by the chazan and those recited by the congregation. These include deletions, comments, several glosses with replacements or textual revisions or customs. Censorship deletions on several leaves. Bound between the leaves of gathering 22 is a piece of paper with a handwritten inscription (in Italian script) of the Seder Selichot for Mondays and Thursdays. Two handwritten leaves are bound at the end of the volume. These leaves contain the verses recited during the priestly blessing and the Yehi Ratzon prayer said at that time. Complete copy. leaves +  handwritten leaves. 29.5 cm. Most leaves are in good-fair condition. Stains, creases and wear. Dampstains to many leaves. Tear to first leaf, the first word is lacking and replaced with a photocopy. Tears to second leaf and to several other leaves, repaired with paper, slightly affecting text. Worming to some leaves, primarily to margins, some restored with tape (some damage to text). Several leaves with narrower margins, possibly supplied from a later copy. New leather binding. The printer R. Chaim Shachor was one of the first printers in Prague, however, following a dispute between printers, he left the city. He settled in Oels (present day Oleśnica, Poland) where he continued working as a printer. After his printing press in Oels was destroyed in a storm, R. Chaim Shachor relocated to Augsburg (Germany), where he printed Hebrew books. 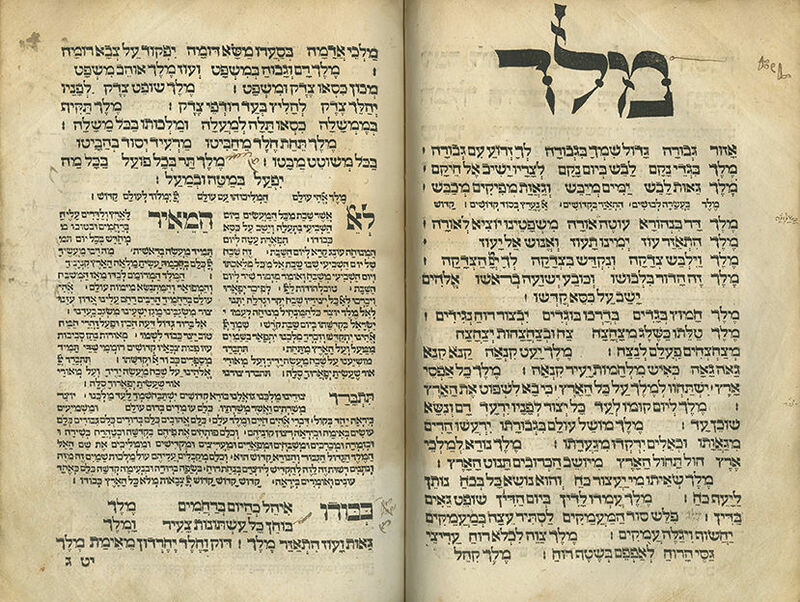 He printed his books, including this Machzor, in an Ashkenazic-style square typeface, similar to the typeface used in Prague, unlike other printers who used a Sephardic-style typeface.